This year, I am vowing to use every tool, every stamp, and as many supplies from my stash as I possibly can. Now, the digital stamps might be a little difficult in that I have so many, and it does take longer to hand color digi's, but I am going to try my best. I am just tired of seeing things in my craft room that haven't been loved at least once! I'm sure all of you crafters know exactly what I mean. I will be tagging these projects as a way for me to track how many items I am finally making use of this year. Earlier this week, I bought a cute set of mini clothespins by American Crafts from Target, and on the package was a picture of a card. I thought it was the cutest thing and I just had to try my hand at it. 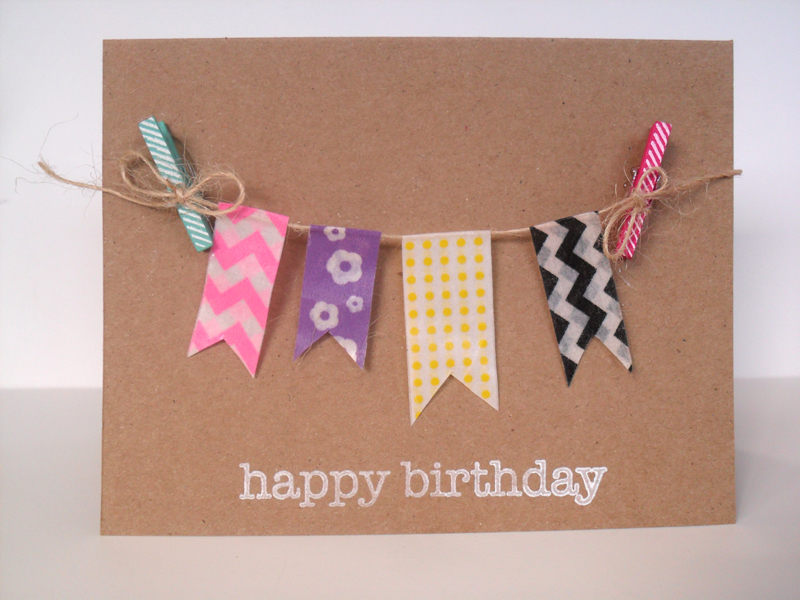 I used Kraft cardstock, natural twine, and washi tape. I have to say that it was a little bit of a hassle working with the washi tape and the twine together because this twine had a lot of loose fibers that kept getting stuck onto the washi tape. The sentiment is from a Hero Arts set which I stamped in Pure Snow by PTI. As you can see, the impression wasn't very even, but art isn't always perfect, right? LOL I do have to comment that the ink pad seemed especially juicy. I am not sure if it's supposed to be like that or not. That's it for today. I'm looking forward to a nice relaxing Sunday cleaning, organizing, and maybe squeezing in some crafting. I am sure there will be some football watching as well. Happy Sunday! Love the card. The washi tape looks adorable:) I need to use up some of my stuff too lol. I know I have things sitting in there that have been in my craft room for years :D Thanks for the inspiration. Love the use of those washi tapes as a banner. Sistah, you sound just like me... too much collecting of new stuffs, and they sit, sit, sit!! I like use 'em!!! But sooo much, what did we get our selves INTO??? Well, I pray that you will be able to obtain that goal. I going try to use mines too. I know by the time I use them, going be out of style already! Aiyah-yah-yah!!!! Love your card, so cute!! I not going get into washi tape, I already know I going have TOOOO much of those cuteness!! !